The Wars of Pooch: Horse? Today started with research. My knowledge of horses comes primarily from horse racing; my uncle always owned a racehorse or two (the type that wins you BIG money when it doesn't bolt! ); but beyond understanding the fundamentals of making a buck or two at the racetrack, thats about where my knowledge ends. So, my issue arose when I tried to paint one! I have painted scant few horses in my years, and certainly not for a very long time (back to when I played Warhammer). So, I began by googling horses, and looking at pictures. 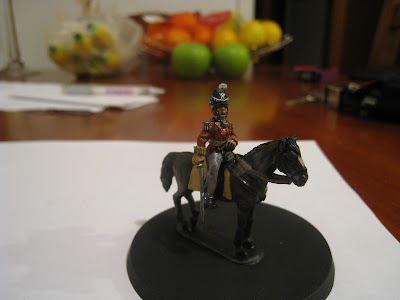 I chose to paint up my two horses as Bays; which was a particularly popular horse at the time of the Napoleonic Wars, to the extent that a British Dragoon regiment was named "The Bays" for their horses! Here are my two attempts to paint some Colonels, both models are metals from Victrix. 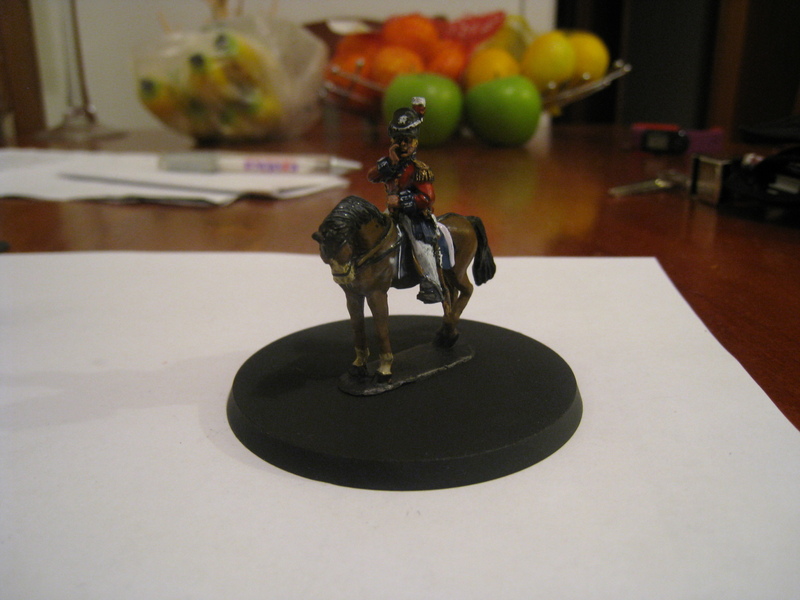 Here is the Colonel for the Guards, on a lovely Light Bay. And the Colonel of the 27th Inniskilling on his Dark Bay. Tragically, the pictures are doing them no justice whatsoever; the Dark Bay looks far more textured, rather than simply a black undercoat as the picture shows! Also, they are far, far less shiny in real life, the Matt Varnish has just not dried yet in the pictures... I need to do some work into making better pictures, but for now these will have to do. I am not totally sold on the saddle for the Dark Bay, the buff could be a bit too plain; although the plain does offset the gilded pompousity (totally a word) of the Colonel! In other news, I managed to assemble my next unit of infantry; a medium British regiment. It will be painted up as the 27th Inniskilling, to give this Colonel someone to order around! I will hopefully get a start on them in the next few days. Keep the updates coming- good work so far. When oh when will plastic Russian infantry be released?